The ‘Blue Planet’ effect had a powerful effect on three young Londoners, who after visiting a remote island in Thailand have launched an environmentally-friendly alternative to bottled drinking water. CanO Water is an infinitely recyclable alternative to single-use plastic bottles, which can take up to 1,000 years to degrade. Environment Journal spoke to one of CanO Water’s founders, Ariel Booker (pictured first on the left) about their new venture and why cans are much better for the environment. Most people think of plastic bottles when it comes to drinking water. What prompted you to look at cans instead? It was a combination of several things, really. We stumbled upon the recycling credentials of the can very early in the development of our product. Aluminium cans are infinitely recyclable. They do not lose any quality. Most cans are made of 75% recyclable material and most of the aluminium we use today was mined in the 1800s. It just keeps going through the same recycling loop, without losing any of its benefits. For us, it was creating a recyclable alternative to plastic bottles. Cans for us were an obvious material to use. 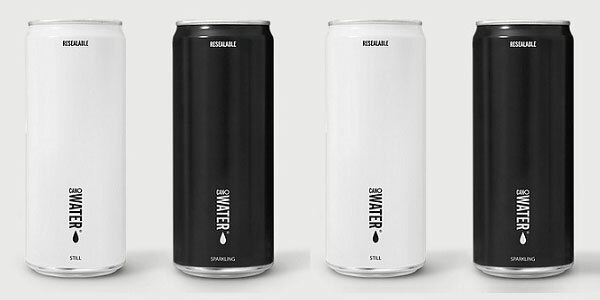 Also, we like the branding aspect of cans, what you can do with them. It seemed to be a nice fit with what we wanted to achieve. The infrastructure is there to recycle every can on the market. Recycling rates in the UK are around 70% for cans. They are hoping to get to 100% in the next five years, which I think is very achievable. That’s why globally cans are the most recyclable beverage packaging out there. Why do you think plastic bottles dominate the market? Virgin plastic is very cheap and it’s something you can transport very easily. It is a cheap industry. How big a threat does single-use plastic now pose to the environment? With the exception of the plastic we incinerate, every piece ever created lives somewhere on this earth. It is spoiling our environment in many different ways It has a purpose. Don’t get me wrong and there’s a need for it in terms of keeping things fresher for longer, but from a convenience point of view, you don’t want to use something for 15 seconds, throw it away and then see it last for all eternity. How important is it to encourage consumers to think about packaging and to buy products that can be recyclable? I think a lot of changes that are happening across the world are consumer led. Consumers can dictate to manufacturers what it is that they want to see. Consumers play a massive part in educating and demanding manufacturers look at a more sustainable alternative. For us, it is about providing an alternative. Some containers are better than others. There’s a lot of ambiguity around what is recyclable and what isn’t. I think that confuses a lot of consumers, who sometimes do not know what to buy. Ultimately, the choice comes down to consumers and put the pressure on those companies to do something about the amount of plastic they put into the market. How big an impact has the BBC documentary Blue Planet had? Blue Planet has been extremely influential. Every time there is a Sky Ocean Rescue documentary or a BBC documentary, the awareness level sky rockets and people start to understand what impact their choices are having. Without people like David Attenborough, a lot of people would be in the dark, because they just do not see it. It’s important to open people’s eyes via the media. Would simplifying all the recycling schemes around the country help? Infrastructure is a big issue and so is the ambiguity around what is recyclable and what isn’t. Tetra Pak is a good example of something that is seen as good for the planet. Yes, it’s made from renewable sources, but from a recyclability perspective, it will never come back as another Tetra Pak carton. Recycling is about closing the loop and people need to understand what that means. It’s down to product providers to educate people about what happens to a product when it goes in the bin. There has not been enough direct education to the end consumer until now. I don’t think people have seen the problem we’ve been building for 50 years. Do there need to be more facilities here in the UK to recycle these products, because in the past a lot has been exported to other countries? The PRN (Packaging Recovery Note) system was weighted towards sending everything to China and now we have got to the point that China has stopped accepting our plastic waste. There needs to be better infrastructure, but it’s also down to the consumer understanding what they can recycle. Again, it’s education and infrastructure and building those two side-by-side will allow us to make more informed choices. What’s your take on deposit schemes. Could they be a way forward? They are a good idea. Deposit schemes enable people to understand what is recyclable and what is not. In theory, it is great for everyone, but at the same time, if you buy a plastic bottle and get 10p back.. I am not sure if the incentives are great enough, but this is what we will see from trial schemes. I think the answer is to move to more recyclable products. Plastic is not terrible in some uses, but to have a plastic bottle nowadays is not relevant, when you have an infinitely recyclable can. I think there’s a real need to invest in more recyclable and infinitely recyclable materials.